Potlucks, barbecues, and birthday parties are on the horizon, which means the opportunity to enjoy a variety of summer desserts, including cheerful cupcakes! For some with food allergies or special diets, this used to mean disappointment – noshing on a bowl of fruit while watching friends dive into that sugary buttercream. But the jealous gazing is over! Now there are oodles of allergy-friendly bakeries and cupcake recipes, and today I’ve got a recipe for vegan gluten-free cupcakes that just might prompt you to celebrate by splurging on those fancy cupcake liners. 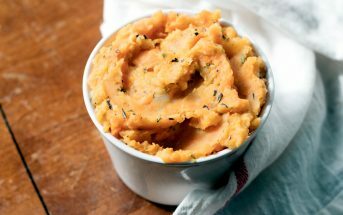 This recipe is from The Complete Idiot’s Guide to Gluten-Free Vegan Cooking by Julieanna Hever and Beverly Lynn Bennett. The publisher said to pick any recipe to share with my audience, and I chose the vanilla vegan gluten-free cupcakes with dairy-free “buttercream” frosting, because I think everyone needs a basic white on white cake and cupcake recipe. Plus, vanilla is my favorite flavor. For a nice decorating touch, dip the frosted cupcakes into a bowl of vegan multi-colored sprinkles or unsweetened shredded coconut. The photo is by Hannah Kaminsky (she also shot the cover photo for this cookbook), and was shot in the winter time … hence the blue background and snowflake decor. Nonetheless, this blank canvas of a cupcake recipe can be enjoyed anytime of year; just picture a pink cupcake liner and rainbow sprinkles and you’re ready to take these babies to a summer gathering. These gluten-free vanilla vegan cupcakes bake up light and moist. Topped with a flourish of vegan buttercream frosting, they're irresistable! Preheat the oven to 350ºF and lightly oil 12 muffin cups (or use paper liners or silicone muffin cups). In a large bowl, combine the flour blend, sugar, arrowroot, baking powder, baking soda, xanthan gum, and salt. In a small bowl, combine the cold water and Ener-G Egg Replacer, and whisk vigorously for 1 minute or until very frothy (like beaten egg whites). Add 3 tablespoons milk alternative, oil, 1-1/2 tablespoons vanilla, and apple cider vinegar, and whisk well to combine. Add egg replacer mixture and seltzer water to dry ingredients, and whisk well to combine. Fill prepared muffin cups using a ¼-cup scoop or measuring cup. Bake for 20 to 22 minutes or until a toothpick inserted in the center comes out clean. Remove from the oven. Allow cupcakes to cool slightly in the pan, and transfer to a rack to cool completely before frosting. While cupcakes are cooking, prepare frosting. In a medium bowl, beat margarine with an electric mixer on medium speed or whisk for 30 seconds. 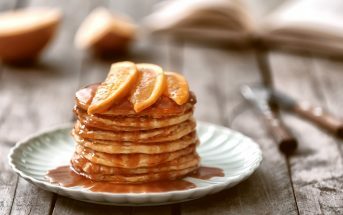 Add confectioners’ sugar, remaining 2 tablespoons soymilk, and remaining 1-teaspoon vanilla extract, and beat or whisk well for 2 or 3 minutes or until light and fluffy. Variation: To make a Frosted Vanilla Cake, pour the cupcake batter into a lightly oiled 8x10-in baking pan, and bake for 30 to 35 minutes or until a toothpick inserted in the center comes out clean. Allow the cake to cool completely, and frost with the buttercream frosting. This recipe is Vegan, Vegetarian, Dairy free, Egg free, Gluten free, Nut free, Peanut free, optionally Soy free, Wheat free, and Low fat. Getting ready to make your cupcakes. I’m excited! Can I substitute Bob’s Red Mills All purpose flour? I have that on hand. Wonder if Bob’s flour will rise well and offer a decent size cupcake rather than the GF shrunken variety I have gotten before? 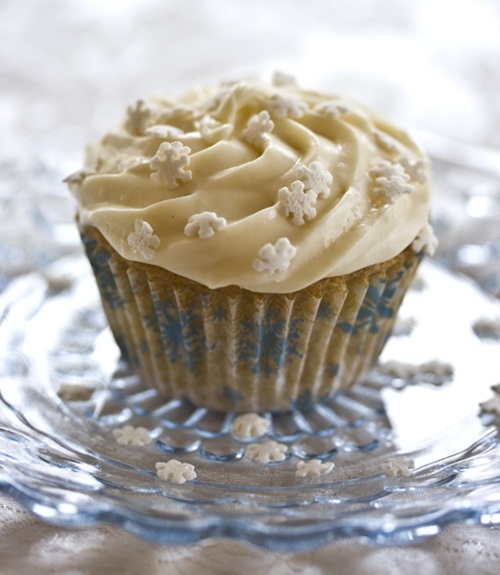 The decorative snow flakes on the cupcake give a classy touch. What are they, sugar crystals? And would you mind letting me know where i find them and other choices like them, thanks. Hi Evelyn, the original recipe was made with Bob’s AP flour! I hope they work out for you! The photo was actually by Hannah Kaminsky. I believe they are just decorative sugar crystals that you would buy during the holidays. If you are going to separate the ingredients for the cupcake and the frosting then you should make sure not to include the “remaining” ingredients for the frosting in the cupcake section. Fortunately my cupcakes still came out as intended! Future bakers please read. Great suggestion Krystal, I will fix that recipe now. Hi Cathy, every recipe is different, but with the water, it would probably be about 2 eggs.